After faltering slightly, luxury building is again booming in the traditionally high-end parts of the country, like South Florida and the Hamptons, as the economy continues to show healthy signs, architects and designers say. But even people with more modest homes in mind are turning their desires into reality. A study to be released this week from Liberty Mutual says that 44 percent of Americans were planning to move or renovate their homes this year. The 2015 Design to Lead Summit will take place on Monday, April 13, and will provide the next generation of design leaders with the education and skills needed to succeed as they take on next step management roles. Don't miss your opportunity to engage and learn from some of the design industry's most prolific thought leaders at the 2015 Design to Lead Summit. Two panel discussions — one in the morning, and one in the afternoon — will provide attendees with new leadership perspectives and a road map to success. The morning panel will address the importance of cultivating a culture of excellence within an organization, while the afternoon panel will focus on strategic vision. The 2015 ASID Legislative Symposium will be held Tuesday and Wednesday, April 14-15, and will provide the training and knowledge needed to preserve practice rights at both the state and federal legislative level. Attendees will earn up to .4 CEUs in breakout sessions focused on building codes and standards, lighting design, the evolution of interior design in the building industry, and national updates on interior design-related legislative activity. They will also learn to engage in the legislative process and receive unique advocacy training led by Soapbox CEO Christopher Kush, and will engage with legislators on the technical and scientific aspects of the interior design profession and how it contributes to each state's economy during ASID Hill Day. Students who attend the ASID Legislative Symposium will receive an additional discount — $170 (ASID member price), or $220 (non-member price, which includes a complimentary student membership). 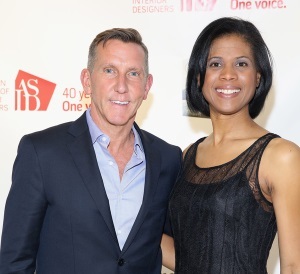 ASID COO Chris Tucker attended the book launch of interior designer Robin Wilson's Clean Design: Wellness for your Lifestyle at the Manhattan store of Mitchell Gold + Bob Williams on March 27. ASID is a partner of the Clean Design national book tour, which will follow Robin Wilson's personal appearances at FLOR locations across the country to personally connect with fans, sign books, and share her vision of stylish wellness design. To learn more about the book tour locations and dates, please visit www.cleandesignbook.com. The workshop series features six Interior Design Continuing Education Council (IDCEC)–approved sessions that focus on topics to help interior designers build successful, sustainable businesses. Attendees can participate in the full-day program or choose sessions a la carte. Learn more and register today. The High Point Market Authority (HPMA), in association with ASID and sponsored by Horchow, will present the popular Design Viewpoints Series April 18-21 at the High Point Theatre. The series offers up to .4 continuing education units (CEUs) to those who attend. All Sessions are IDCEC-approved. Learn more. ASID returns to ICFF with an expanded educational program for industry professionals and a new Student Day program. Positioned on the show floor, the ASID Educational Series will bring together thought leaders and industry experts to present provocative content throughout ICFF. Sessions will appeal to a cross-section of design markets and will include topics on business practices, the impact of design on human health and wellness, housing trends, and materials. Registered session attendees will earn 0.1 IDCEC-approved continuing education units (CEUs) per session. Register for the ASID Educational Series today. Attendees must register for ICFF separately. The ASID Foundation provides scholarships and awards for individuals like you who are dedicated to advancing the profession of design. Applicants are awarded financial assistance for their outstanding work in interior design research, behavioral science, business practice, design process, theory, and more. Awards of up to $5,000 are available for undergraduate students, graduate students, and educators. Both ASID members and non-members are eligible and can apply at no cost. Applications will be accepted from March 1 – April 30. Learn more and apply today. Make Your Mark on the ASID 2015 Chapter Challenge? Complete Design Success University's 6th Annual Interior Design Fee & Salary Survey by April 24 and founders Gail Doby and Erin Weir will give you 50 percent off their brand-new Business Assessment, a publication that identifies the seven most common business-related problems you're facing and generates a customized report detailing how to fix those problems. You will also receive free access to the Gail Doby Coaching & Consulting Perks Program, which gives you great deals on everything from travel, auto purchases, clothing and gifts. Begin here. Severe weather continued to depress design revenue at architecture firms in February, with growth rates remaining well below typical 2014 levels, reports the American Institute of Architects. With a national Architectural Billings Index score of 50.4 for February, billings increased somewhat from the 49.9 reading in January. New design contracts were also weak in February, posting a 50.0 score, which signifies no improvement over January levels. Even new project inquiries, though indicating growth, were at their slowest pace of increase in two and one-half years. In the past, the names of famous designers often were synonymous with a particular style or trend in design. Their calling cards became a signature fabric or wallpaper; their work projected a lifestyle that was inseparable from their identity. Nowadays, interior designers — and the clients who seek them out — are taking a more malleable approach to decorating, adapting personal instincts to each individual project. High-tech and high design come together in innovative products that perform and are sustainable, too. With the rise of the micro-apartment, windows and natural light are set to become rarer. While people can place potted plants inside apartments for a touch of nature and to help with air quality, windowless dwellings still will lack natural light. However, there will be options for digitally mimicking the light that would normally come in through windows. In thinking about the importance of having an effective contract, these words come to mind: "I prefer clarity over agreement." As designers we should definitely be working with a contract, but if the contract is not clearly written with all the necessary components, it can lead to great frustration and disagreement during the project and/or after the project is completed. The expectations need to be clear for both parties before they agree and sign the contract. The deadline is a critical tool, used by the most successful people in the world to make things happen. Completing projects in a timely manner and beating the inevitable priority shift is the result of setting proper deadlines and working to achieve these goals. Setting deadlines not only helps your team complete their work on time, but it also sets proper expectations with your clients. Many creative professionals, whether they're designers, architects, or writers, prioritize client work over personal projects. It can be hard to take something you dreamed up in the shower as seriously as a project that a client commissioned and offered to pay you for completing. The way to do self-initiated projects is to treat them like client projects. You can't treat them differently, or they become secondary or fall through the cracks. Looking to take your design business to the next level? Reach that goal by remembering this: Work with good clients. Don't work with bad ones. While bathrooms are most likely to remain the same size, certain changes will be more popular than others. Remodeling trends for 2015 include larger showers, more accessibility features, and double sinks, according to a newly released Houzz survey. Overall, demand for second homes is surging, especially among luxury buyers, according to data from Realtor.com. An analysis of some of the top resort areas in the U.S. shows that prices are rising in many places, partly driven by lower inventory. Here is a market snapshot of five popular second-home destinations. When planning your next home design or remodel project, remember to incorporate seating opportunities throughout the home. A bench at the back and/or front door for removing shoes, a seat in the shower, a chair or storage bench in a walk-in closet, a chair or storage bench in a bathroom, a window seat at the landing of a set of stairs, a banquette or eating bar in the kitchen — these are just a few ideas to consider. The Pantheon. The Panama Canal. The Hoover Dam. When you think of concrete, you might imagine great feats of engineering, or at least highway overpasses and other sturdy, stolid structures. But concrete has become a stylish medium in the home, thanks to interior designers and artisans. A recent report from the Universities of Cardiff, Exeter, Queensland, and Groningen suggests plants in offices increase productivity by 15 percent and workplace satisfaction by up to 40 percent, according to Ambius. The study, published in the Journal of Experimental Psychology, states that employees in green environments also report higher concentration levels. While most of the focus on green certifications such as LEED and ENERGY STAR is on the cost savings associated with sustainable practices, a new study from DTZ shows that occupants in green certified buildings tend to be more satisfied than those in conventional buildings. The researchers found that buildings with at least one certification averaged a satisfaction score at least seven points higher than uncertified facilities. Think that's a daring color combo in the fabric you just found? Go outside — it's highly likely you'll see something even more fearless. The color palettes you'll find in nature are mind-blowing, so when you need inspiration, take a hike. Peer-to-peer rental platforms, recent demographic shifts, and customer review forums have changed the hospitality industry and will continue to do so. Accordingly, hospitality brands are placing new emphasis on the guest experience by maximizing convenience through digital technologies, and facilitating location-specific, individualized travel. Here's a look at the emergent trends that will continue to drive the effort among hospitality brands to build a positive reputation and earn customer loyalty. A study published in the latest issue of American Behavioral Scientist indicates that "workers who were encouraged to utilize flexible seating arrangements in a remodeled space had a higher proportion of face-to-face [and IM] interactions with colleagues outside of their team." The researchers also observed that "the likelihood of communication between employees was inversely related to the distance between their seating locations [i.e., more distance, less communication]." As the material, spatial, and technological options available to store designers expand ad infinitum, let's not forget the service-driven design fundamentals. Think like the customer. Be the customer. It's not complicated, but it is critical. A new report from the Center for Health Design shows that while there will be significant expansion in mental health services for 62 million Americans as a result of provisions in the 2010 Patient Protection and Affordable Care Act, little attention has been given to the role of the physical environment in behavioral health settings in the past 40 years. Fueled by the trend toward evidence-based design, research on healthcare facilities has increased during the past 20 years; however, studies addressing the design of behavioral health environments are few.